Congratulations to our Client Mixed Chicks for their feature in Good Housekeeping. 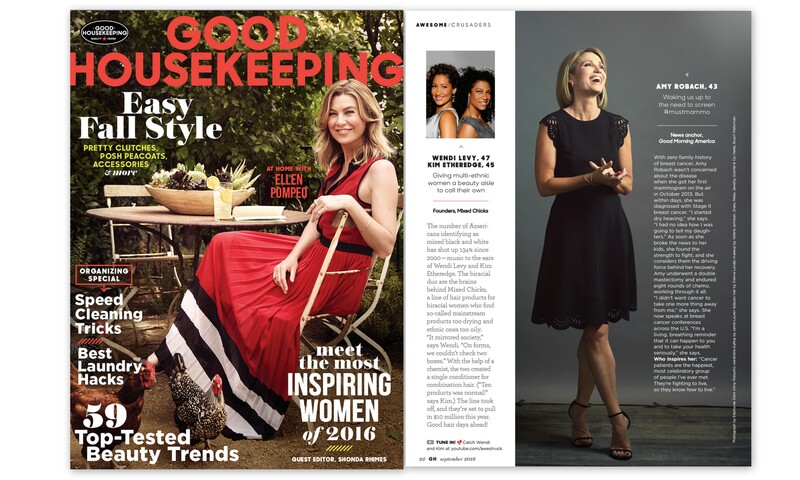 Mixed Chicks founders, Wendi Levy and Kim Etheredge, were named two of Good Housekeeping’s 2016 Inspiring Women. The number of Americans identifying as mixed black and white has shot up 134% since 2000—music to the ears of Wendi Levy and Kim Etheredge. The biracial duo are the brains behind Mixed Chicks, a line of hair products for biracial women who find so-called mainstream products too drying and ethnic ones too oily. “It mirrored society,” says Wendi. “On forms, we couldn’t check two boxes.” With the help of a chemist, the two created a single conditioner for combination hair. (“Ten products was normal!” says Kim.) The line took off, and they’re set to pull in $10 million this year. Good hair days ahead! Mixed Chicks is a diverse brand dedicated to solving the unique hair and beauty issues that face the multicultural woman and man. Men, women and children can refresh, nourish and protect their hair with quality ingredients that deliver results with Mixed Chicks.